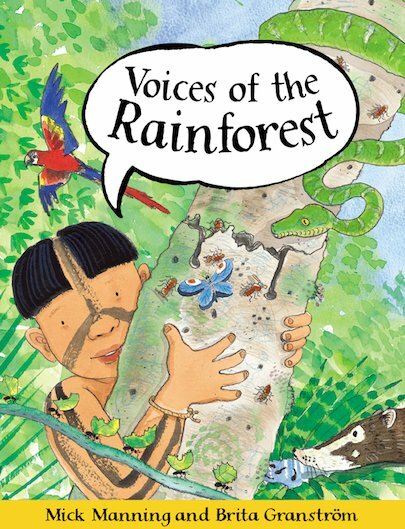 Come on a journey through the rainforest, from the high canopy to the leaf-litter rotting on the ground. Discover all the animals and plants that live together in this remarkable habitat, as well as the people who depend on them for survival. Brita Granström, illustrator of the charming picture book No More Yawning!, grew up on a farm in Sweden. She studied Illustration at Konstfack in Stockholm. Brita is married to fellow illustrator Mick Manning and they live with their children in the North of England. Mick and Brita have worked closely together on children’s books for fifteen years. Their first book together, The World is Full of Babies, won the Smarties Silver Prize in 1996 and their second book, What’s Under the Bed?, took the TES Junior Information Book Award in 1997. Yum Yum and How Did I Begin? were two of the six prize-winning children’s books selected for the Rhone Poulenc Prize in 1998. In 2000, Wash, Scrub, Brush! won the English Association’s Key Stage 1 Non Fiction Award. In 2005 they won the English Association Key Stage 1 Non Fiction Award again with Voices of the Rainforest (Watts) and were short listed for the Key Stage 2 award with Fly on the Wall: Roman Fort and Viking Longship, and won it for the third time in 2008 with Fly on the Wall: Greek Hero (Frances Lincoln). Mick and Brita have also collaborated with other authors including: Karen Wallace, Martin Waddel, Sam McBratney, Kathy Henderson and Joyce Dunbar. Brita won both Parenting Magazine’s Book of the Year 1999 and the Oppenheim Toy Portfolio Gold Award 2000 with her illustrations for Judy Hindley’s EYES Eyes, Nose, Fingers, Toes while their next book Does a Cow Say Boo? (Walker) won the Oppenheim Platinum Award 2002.